If you are viewing this page you have an old bookmark or link. Please Click here for the new Page. Homes destroyed: 915 homes, 10 commercial buildings destroyed. This is Old Information, You are using an old Link. For new information, Click Here. Mountain Residents can pick up their mail at 195 Del Rosa in San Bernardino! 8:00 pm Friday - I'm answering emails as fast as I can, please be patient. 7:00 pm Friday - Fires in Running Springs are looking positive. Not out but being held back. Super Foggy. Edison is fine with letting people back into Crestline area in 4 days. But they are not the final authority. Drove up from Twin Peaks to Rim forest along Bear Springs Road. Everything looked good along the road. Report on the Cedar Glen Area. Wow, what a job. I'll try to have more later. Very Dangerous. Heavy Ash falling. Trees down. Findings below. Lilac Everything before and including 266 & 265 and a chevy van that hasn't moved in a long time in front of a burned out house. Box Dr. Last house on street stands. 1 of 5 cars survived GPS- 34° 15.71 N, 117° 9.39 W.
Cypress Gold Jeep Cherokee (4JYB634) sitting unburned in a driveway of a burnt house. Everything else burned. 5:20 pm Friday - Ranger Al is in Cedar Glen Right now. I'm talking to him on the phone. I will have an update on homes in a few minutes. I must apologize about the emails folks. I haven't got many out since we've been working on the burned homes update. I am really backed up. 423 emails waiting to be answered. I'm supposed to take my kids Trick or Treating in an hour. Things are not looking good for that. I have a house I can go to if I choose. The thought of the 90,000 who don't have that ability will keep me working. I will stay here and continue updating. If anyone sees a 5 year old Pink Witch, a 7 year old Ninja Vampire and a 2 year old Ghost knock on their door, tell them that their dad say's hi and he loves them. Stay out of the Big Bear Area. The fire is close but is being kept back by the weather. Please Evacuate. Email notice- I would like to ask everyone to please only email me if you have a real important question or comment. I'm not able to give information about Big Bear or Running Springs or Status of burn areas if I am busy answering the same questions over and over. I don't mean to say that anyone is not important but at this point I must prioritize. I am going to list not vital questions with their answers here. VOE VOE area is safe. There were no fires. Reportst that homes burned there were actually in CCP. Gregory The whole Lake Gregory Area is safe. Ranger Al lives there. It never stopped being the safest place on the mountain. North Shore The North Shore North of the Dam is safe. The fire threatened the hospital but didn't burn any structures. This includes Grass Valley and the Country Club area. Blue Jay Blue Jay and Agua Fria is Safe. Reports that Jensen's or the Ice Rink burned are false. Cedar Glen Cedar Ridge area didn't burn with Cedar Glen. Hook Creek road West of Deep Creek Camp Road didn't burn. The business area of Cedar Glen didn't burn. The Village The Arrowhead Village Area is fine. Villas The Arrowhead Villas is fine North of 18. Twin Peaks Only one home burned in a freak accident on Hwy 18. Read more about that in the notes below. Running Springs Fires are being battled still. I have no info on specific addresses yet but I haven't heard of any burnings. Green Valley Lake I haven't heard of any burnings in the area. I believe the fire isn't near at this point. Arrowbear I haven't heard of any burnings in the area. I believe the fire isn't near at this point. Big Bear Watch out- Get out, the fire is coming. Arrowhead Villas. We traveled down Arrowhead Villa Rd, Around all the side streets and up and down Kuffel Canyon. No homes burned. Yellow house (now red due to flame retardant) Marked "Desire"
3:55 pm Friday- Trick or Treating in Redlands. Starting at 5pm tonight at the LDS Church on Pioneer Street in Redlands for evacuees. 3:27 pm Friday- Crestline Village Water Company reports no damage to any of their system. 2:15 pm Friday- Skyland area in Crestline update- Homes burnt. Sorry it took so long to get this info to you. It might be hard to read. It's a mess up there. Trees are down everywhere so we couldn't drive in but here is what we could get. More info coming from Rockview Area. Stay watching if this is your area. more houses coming in. 2:00 pm Friday- CNN reports that it might be Saturday November 8 before residents are allowed to return. I have no confirmation on dates yet. I'm hoping its sooner. Over 90,000 people away from their homes. My friends and family are among you. Try to keep spirits up. I am trying too. The worst part is the not knowing whether you have a home to go home to. Many of you have found this site useful for detailed information but for the most part, people have to rely on TV news. Let's do two things. Let's let the Media know what we need to hear or lets get them to tell people about this site. As long as people get the info. Cedar Glen- We have been trying to figure out how to best help those in Cedar Glen. Address Checking is next to impossible in that area because we can't see street names or addresses due to the fire. So this is the plan. Ranger Al is armed now with a GPS device. He is going to give us the GPS coordinates around the burn area along with address's of all the homes in the burn area that are still standing. Hopefully this will be the best way to accurately display the destroyed homes. Running Springs- Firemen are actively defending RS. School is fine. Wow, this is getting to be a real long page. hmmm. I think it needs a reorganization. I think I should combine all my address that burned into one area as well. Hmmmm. Decisions decisions, answer more emails or reorganize. 1:45 pm Friday - If you are here for the first time please read this column before you email me. I just got another 150 or so emails. I am answering as fast as I can. I'm backed up with over 300 now. I'm just one guy answering these. Don't hate me if it takes me hours and hours to get back to you. Please read this information first!!! I just heard there are people contacting the Tonight Show to try to get Ranger Al on as a guest. LOL. 1:00 pm Friday - Reports that fires near Hesperia are controlled. There are a few small towers of smoke coming from the back side of the mountain but nothing big. 12:55 pm Friday - The Church of Jesus Christ of Latter-Day Saints has local "Trunk" or Treats set up at their local buildings for all those evacuees that would like to take their kids trick or treating. They are also organizing such events in the high desert and San Diego areas. I will post information on these as I get them. 12:30 pm Friday - A lot of emails want to know about Blue Jay. Blue Jay is safe. Rumors that Jenson's and the Ice Castle burned down are totally false. North Shore area and Golf Course area is ok too. 12:15 pm Friday - No worries about gas. Ranger Al has 100 more gallons. Thank you for all those who were willing to donate. Cliffhanger update - Ocean View Drive- The addresses listed are standing but 2 houses east of 25008 have burnt as well as the house across the street from 25008. Also the house across the street from 24988. 1 house east of 24929 burnt. The house on the west end of Ocean View and Crest Forest Drive is burnt. (Corvette burned in the driveway) I must repeat the addresses listed 25008, 24988 and 24929 are still standing as well as any home that doesn't fit the descriptions I've listed. I wish I could be more specific but even digging through the rubble, Specific address can not be found. 12:03 pm Friday - A lot of people are trying to get up the back side of the mountain. Traffic is thick up the Cajon pass. The roads are all blocked off and they are turning you away. Just wanted to save you a trip if you were thinking of trying it. Ranger Al says seeing trees that are Black on bottom and White on top from frost is really unique. We will try to get pictures soon. Back fires and fire breaks are actively being made in Running Springs. Big Bear- Its getting close. 11:11 am Friday- I have a thing with my wife to think of her every time I see the time as 11:11. Took a quick second to call her. Now I'm back to the emails. 250 of them. Please be patient. Ranger Al is actively viewing homes in the cliffhanger area. I will report as soon as I hear from him. He then will head to Arrowhead Villas and down into the burn zone. 10:45 am Friday Morning - TWIN PEAKS NEWS - I know everyone's been wanting to know. This is the scoop. Do NOT get worried and read this whole paragraph. A home at 25706 Hwy 189 in Twin Peaks has burned. BUT......... It looks like a whole separate fire. There is not any other homes or even forest burned near it. The rest of Twin Peaks looks fine. 10:20 am Friday Morning - My inbox is backing up to 200 right now. I am typing as fast as I can. I'm trying to keep the website updated as I do this. Please keep your email to a minimum. It is taking me a long time to read the emails that are 3-4 paragraphs long. Also be as specific about property as possible. I do know a lot about the area but just telling me a street name is hard to understand. Each town up in the mountains can have that same street. I'm really sorry if it takes me a long time to reply. I am only 1 guy. :) Speaking of which, you may want to listen to KFI am 640 at noon. You might recognize the guest. 10:10 am Friday Morning -I received information for any members of the Church of Jesus Christ of Ladder-Day Saints that are evacuated from the mountain area. Services will be held at the Northpark Building in San Bernardino at 1pm on Sunday. 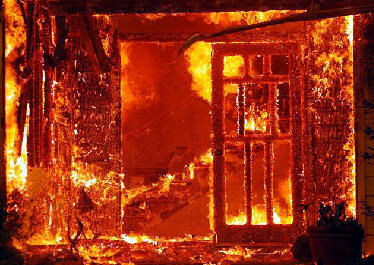 Any other organizations that have similar information can contact me at admin@fireupdate.com. 9:37 am Friday Morning - The fires are being beaten by firefighters in Running Springs. I believe the structures including the Cedu schools are safe. More info about CPP- Just got back from a visit there. 743 sandhill and the home across the street (couldn't find address) have burned down. This is not a recent fire but we were unable to confirm this in our visit yesterday. 9:25 am Friday Morning - I've been asked a lot about the status of other towns. Arrowbear, Green Valley Lake, Angelus Oaks and others. For now these areas are safe and I haven't heard about any burning. I will continue to update. I just answered 30 emails but got 80 more. :) Fun Fun. North Shore- If your home is on the North Shore of Lake Arrowhead please do not email me. Homes on that side of the lake are safe. 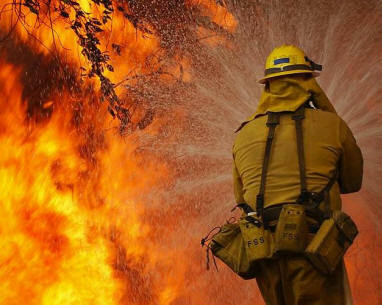 All dangerous fires are away from CPP, VOE, Crestline, TP, RF, Blue Jay, Lake Arrowhead & Cedar Glen. Running Springs- Fires are very close to being under control here. If the weather keeps up, we will win this one. Down the Mountain- Areas like Yucaipa at the base of the mountain are justifiably being warned but I don't believe there is any imminent danger. 8:30 am Friday Morning - A big thank you to those who started to call me at 5am. It'll make me think twice about ever publishing my cell phone again. I guess I'll sleep sometime next week. 139 emails waiting for me when I arrived here at the office, 8 of which included viruses. :) I have to count my blessings, I still have a house. K, on to bigger things. Running Springs Front- Firemen have kept the fires down overnight. The weather being a huge help yet still an obstacle to the firemen. I'm sure you all know what I'm talking about. If you've lived on the mountain for even a small amount of time, traveling around the mountain in the fog can be challenging especially for people who don't know the mountain very well. There are still some hot spots around RS but the big uncontrollable "Wall of Flame" is no where to be seen. Big Bear- Fire is only about 5 miles west of Big Bear right now. Let's hope the weather can slow it down long enough let us prepare. Good news, we may be up for one of our first big snow storms of the season! Wow, what timing for these people in Big Bear. Hesperia- From what I've heard there are still some fires around the area. I will find out more and let you know. On to my morning research. 3:00 am Friday Morning- I remade all the maps down below with updated information. My email box is empty. I'm going to bed. I'll try to be up as soon as possible in the morning. Ranger Al is starting his day at 5:30am. So I'll have some good info to report when I wake up and noon. :) ok, I'll get up early. See you tomorrow. 1:15 am Friday Morning- Weather conditions- Wind is blowing SW at 20 MPH. 60 degrees, humidity 50. The following map is from 5:00 pm today. Thanks to the Forest Service for the info. 1:00 am Friday Morning- Just checked the stats for today. 459,985 Hits, 48,113 Page Views. Wow! It looks like people really do look at this site. I thought for a while everyone just emailed me. Glad to see it. No wonder the site ran so slow this morning. Big Bear Lake- Fire looks like it is coming. Ranger Al need to spend most of his time in the lower communities. If you know anyone that is still in Big Bear, please have them contact me so I can offer the same detailed information there as I'm trying to do for the other areas. 12:30 Early Friday Morning- Just finished my emails. Whhheeewww. 506 replies today. Hopefully I'm done for the night, so I can focus on updating the site. 10:00pm Thursday -I've heard that the gas station in Rim Forest will be open with generators Tomorrow from about 5-6 different sources. If this is true it will be a blessing for Ranger Al. Thank you to all those who emailed me about donating some gasoline. I've replied to about 394 of your emails so far since 10 this morning. I still have about 85 in my inbox. I am going to take a quick break from that for a while and call my wife and kids. I'll be updating some maps and pictures on the site soon. Thank you for your great comments, that is what I am running on now. 9:00pm Thursday - Fire is in the forest heading toward Lucerne Valley as well as around parts of Running Springs. If the weather stays cool and foggy, we may be able to stop it before it grows wild again. Good news. Supposed to rain tomorrow. 7:30pm Thursday - I just heard on the radio that no homes were lost in Cedar Pines Park. It was even one of the biggest stations in Southern California. This is absolutely untrue. The home listed below did burn down. Ranger Al gathered the addresses 1st hand. 6:20pm Thursday - Fire is being fought at the bottom of Running Springs School Rd near Seymour Rd. I cannot give you information on specific residences in the Cedar Glen Burn Zone. There are so many homes burnt that wasn't able to tell what address was what. Please read below for the information on the houses I did find still standing. Do not email me and ask about other houses in this area. If your house is North of the Dam you should be safe. If your house is off of hook creek before Deep creek camp road then it has a good chance of still standing. 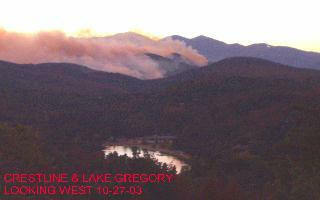 6:00pm Thursday- Yes it is true that the fire is creeping up deep creek behind North Running Springs. It is moving slowly because of the weather. 5:20pm Thursday- Hot spots in Running Springs. They are carving fire breaks. The heavy fog has made it really hard to travel and see the fire. But the fog helps slow down the fire too. Fire that went through Cedar Glen is still heading North. May miss Big Bear. I haven't had a chance to update my maps yet, too many emails but I will find time tonight. 4:00 pm Thursday- I am getting really overwhelmed. I have 300 new messages in my email box and have replied to over 250 so far today. My phone is ringing off the hook. Please read this site first before you email. I am trying to get to as many emails as possible. Be patient. Edison reports it could be a week before electricity is back on. Ranger Al is in need of Gasoline for his generators and his vehicles. If Anyone has any available on the mountain please contact me. His supply will only last a couple more days. I'm a little frustrated with the fact that they let media up and down the mountain and have free roam and Ranger Al has to avoid being kicked off the mountain. I have been turned down twice to go up the mountain to give Ranger Al a digital camera and some supplies. If there are any firemen or police that can help me. I would like to keep this website going. The networks aren't able to give all the detailed information that I know the evacuees want. Also please help get the word out. Many evacuees think that their only resource is the TV news. If you like what you see here, help others see it and contact the larger media and let them know about this site. 3:45 pm Thursday- Cedar Pines Park Mozumdar Addresses from 729-829 not including 829 have burnt. The temple survived but the outbuildings didn't. Muzumdar and Sandhill area- still too hot to tell. Still some hotspots. I'll try to get back in. Top of Crestline- West of Catholic Church on Valley View. 22664 and 22680 and the house in between those houses and one across the street (i couldn't see a number) and 22671 have all burnt. 2:15 pm Thursday- Cedar Glen. Visited. Looks as if only the area past the Forest Lawn Boy Scout Camp Burned. The following address's didn't burn. 29686, 29682, 29676, 29656. There was also a big grey house near 29656 that didn't burn but I couldn't see an address. Most other houses I saw did burn. Things are looking good for the whole area. 1:30 pm Thursday- Lake Arrowhead- Fire has moved past the cedar glen area and into the forest. North Shore homes look safe for now. Rim Forest: Addresses that have been confirmed by Ranger Al as being Burned: Hwy 18 addresses 26262, 26272, 26276, 26288. there may be another house in that area. Its hard to pick out the houses in the rubble. Cable Place is gone, Alpine and Trust Businesses are gone. Small part of the lumber yard. Cedar Pines Park: Housed burned on Peak Circle. 21411 is OK and 21543 is OK, but the 3 houses in between those burned. Also 1 house across the street burned. I couldn't tell the address. The Big White House on Sawpit Canyon that "The Hand" movie was filmed at was burned. Cliffhanger Area: Cliffhanger is OK but lots of burning around it and damage to outside of building. 11:00 am Thursday Morning- Sorry there hasn't been an update for a while. I've been having server problems. Donations to expand the network are appreciated. Fire Strike Teams have been seen leaving Crestline and heading for Lake Arrowhead which means that Fires near the Cedar Pines Park area are under control. Lake Arrowhead- Fire has burned back side of Cedar Glen area. Around Hook Creek Rd, 3 miles east of the "malt shop" Other homes in the area are safe. Unless your house was near Hook Creek, your house has a good chance of being safe. Houses on the North Shore are not burned for now. Cedar Pines Park- Housed burned on Peak Circle. 21411 is OK and 21543 is OK, but the 3 houses in between those burned. Also 1 house across the street burned. I couldn't tell the address. The Big White House on Sawpit Canyon that "The Hand" movie was filmed at was burned. Raining/Drizzling Very Foggy in the Mountains. 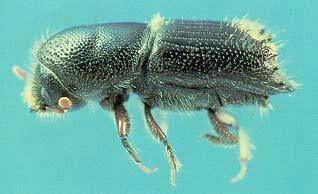 Back firing occurred in the Santa Ana Wash area. Area surrounding Rim of the World High School has calmed. Cedar Glen and Hook Creek--This area of Lake Arrowhead suffered significant losses. The fire is still active in Cedar Glen. Green Valley Lake--Fire is currently burning near this community. Twin Peaks--Structures have been lost near Crestline. 11:00 pm Wednesday- Fire is 10 or so miles from Big Bear. It is still threatening Running Springs and Lake Arrowhead near the hospital. Strong Gusty Winds will make the battle hard. 8:15 pm Wednesday- Fog is rolling into the Crestline area. The dampness should help slow the fires progression. 4:15 pm, Wednesday- At least 8 homes burnt in Cedar Pines Park. The water drops helped a lot and limited the fires growth. Burned vehicles lie among the ruins of homes on Saturn Way in Crestline. 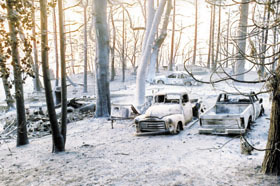 The scene looks like fallen snow; in this case, it is ash from the fire. 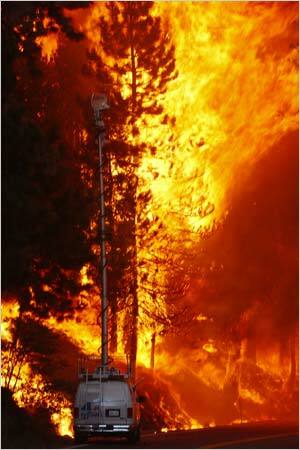 Photo by Lee Reeder.ire' and went on to destroy over 25 homes in the Skyland area of Crestline. At this time Running Springs is threatened, and mandatory evacuations are in force. Photo by Lee Reeder. 3:15 pm, Wednesday- Reports that school in Crestline burned and homes in VOE are burning are false. 2:45 pm, Wednesday- Areas of Cedar Pines Park are burning actively. Structures on Mozumdar Dr. are burning. 2:15 pm, Wednesday- Lake Arrowhead- Fire has burned through Cedar Glen and Little Bear Creek and is wrapping around to the Hospital Area of Lake Arrowhead. Wind is blowing North East. May blow fires down to the Lucerne / Apple Valley area. Crestline- Cedar Pines Park is actively burning. They are still dropping. 1:30 pm, Wednesday- Very active fire drops. Filling from Lake Gregory, a set of 6 helicopters are carrying water straight to the Cedar Pines Park Area! They are dropping about one load per 2 minutes. Battling the fire from the air. The first major flame front tried to jump Highway 330 into the Enchanted Way cul-de-sac in Running Springs at 12:07 p.m. Fire crews on the highway used their hoses to turn most of the flames to steam. But for a few minutes, the fiercely burning flames created the likelihood that glowing embers would trigger spot fires among the homes. Just before noon, firefighters began making a stand near the Hesperia Airport. According to Burbank city firefighters on the Summit ridge, there are two flanks of the Old Fire approaching. One is coming from the southeast toward the airport. Another from the southwest toward the Hesperia neighborhood near Halinor Street and Cottonwood Avenue. The firefighters are making a stand here to keep the fires from merging. Part of the Old Fire burned down the mountain Tuesday night and early Wednesday and is edging closer to suburban Hesperia. About every three houses, there are fire engines parked, backed up, facing the street. This area overlooks the Summit Valley. One house has already been sprayed with fire-retardant foam. By mid-morning, residents rushed in and out of their rural residences in the unincorporated Hesperia area known as Oak Hill. 11:45 am, Wednesday- Firemen are backing out of the Cedar Pines Park Area. There are not very many easy escape routes due to the windy roads. They will have to lose structures in the area. Most of the reporters are up in the Lake Arrowhead area so there are no reporters in the area except for Ranger Al. 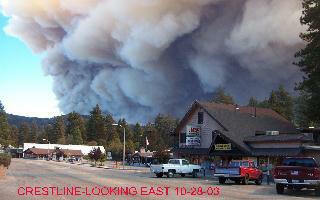 Questions for Ranger Al are now routed through admin@fireupdate.com. Contact us for the latest on the Old Fire Fronts. 11:15 am, Wednesday- Fire is burning near the south east side of Arrowhead near Hook Creek Road. Structures have been lost in the area. I will try post any more info I get. 10:45 am, Wednesday- Ranger Al has traveled and toured the Cedar Pines Park area. The look for the area is grim. Fire is coming quickly up Mozumdar Dr and Sawpit Canyon. There are few Firemen in the area. Homes that are in heavily wooded areas or don't have easy escape routes will probably not be protected. Major loss of homes are expected in the Cedar Pines Park Area. Valley of Enchantment is safe for now. Crestline and Lake Gregory areas are not in any immediate danger. 8:30am, Wednesday- The fire is on the North side of Crestline now so the first time Smoke is visible in the Main Crestline area as it is being blown over the hill from the fire burning on the backside of the mountain. 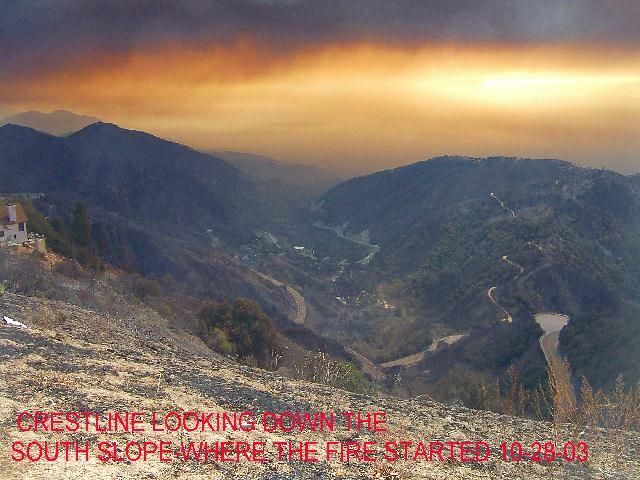 The main areas of Crestline are still safe for the time being. The hill between Silverwood and Cedar Pines Park is burning up near the old Mozumdar temple. South end of Hesperia is being evacuated. As the fire tears through the Summit Valley and Lake Silverwood area. Fire has reached Running Strings on the Eastern Front. Still attempting to keep the fire on the South side of Hwy 18. 10:30pm, Tuesday- The Western Part of the Fire has turned North and is heading for the Hesperia Area. Summit Valley, Telephone Canyon & Las Flores areas are in danger. 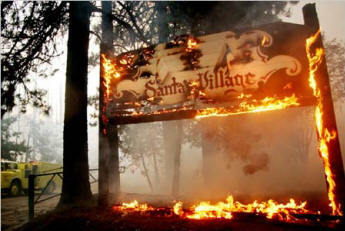 Parts of Santa's Village have burned. 12pm, Tuesday- West of Strawberry Peak is burning. Structures in Rim forest are burning. Apache and Blackfoot Trails in Rim forest- 10 homes burned. Charter Cable store is in question. Drop planes are actively dropping all over the mountain. 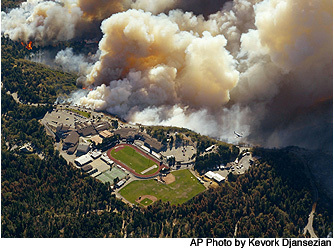 5am, Tuesday- Firefighters are desperately trying to defend Rim of the World High School. 10pm, Monday- Fire jumps Red Rock Wall and begins to actively burn North of Hwy 18. Fire is still about 1 mile south of Rim high school. Monument Peak area is actively burning while as it heads over the hill and is seen by Hesperia Residents. The fire is actively burning all along Devils Canyon Road but no houses burnt so far as far as we could tell. Fire has jumped into the Pinecrest- Church of Scientology area. I would like to personally thank Stater Bros. for putting up an additional $50,000 reward for the arsonist. Now its up to $110,000. Thank you to John McIntosh for some picture from the area. I've posted some below. I have just got off the telephone with a former Rim Hi Grad, Dotty Pierson (Evans). She told me both of her brothers lost homes in the firestorms. One in Cedar Glen of Lake Arrowhead and the other in Enchanted Forest area of Crestline. They lost many mementos plus cars trucks etc. Both quite literally have the clothes on their backs and a the car they escaped with. Views from KNBC are showing that most all of upper Cedar Glen homes are gone. Astoundingly a few houses on Hook Creek road were still standing. One was a fellow who used to be a firefighter before he moved there back in the mid 1980s. He said that when the bark beetle started to take hold two years ago, he developed a plan to save his place when the fire event happened and he knew it would. He spent over 30,000 bucks (some of his neighbors mocked his efforts and said he was spending way too much money) on installing an underground water tank to have an independent water supply for his place. Then he removed some twenty or so dead trees from around his place (his place is wood and wood shingles too). He installed sprinkler systems around and atop the house. He also obtained self contained gasoline driven fire pumps (these are kind I used when I was in the Navy) Anyhow- he also bought gallons and gallons of fire fighting foam (this is used for flammable liquid fires like oil but puts down a good fire resistant base). He had been planning on this fire for two years. He was not scared to stay in the area because of his preparations and his training. He used his equipment and experience and saved his house, all by himself too, he knew he was on his own. Everything around him is gone it looks like a moonscape. Now to be fair most of those people probably could not afford the price he paid for fire protection. Cedar Glen is a working class area and most are not as rich as those around the lake front. But never the less he showed that it could be done. When rebuilding starts as it eventually will, he probably will have some input to add to fire protecting houses in obvious fire prone areas such as the densely packed areas like Cedar Glen or Blue Jay or maybe the Crestline/Cedar Pines park area out on Sawpit Canyon road were I used to live. There were only sixteen strike force firefighters in Cedar Glen yesterday evening and night, I heard they were from Crest Forest Fire district but can¹t confirm it. Anyway they stood their ground and held the line and by their efforts alone saved at least 300 or more houses in lower Cedar Glen area before they were forced to leave for their safety. Had they alone not done this the loss toll would have been well over 600 homes in Cedar Glen. I have no reports of Kufel Canyon area though but the Arrowhead village and surrounding areas are largely intact or so the reports go. Last night when I was looking at this area of Cedar Glen via helicopter shots, the smoke and fire were unbelievable. I was astounded that there were people down there in the middle of it! We all know how small and twisty those roads are and how easily you could get trapped by falling and/or burning trees as one news crew almost did yesterday. Cut now to a shot from a chopper over the Cajon Summit. It shows now the entire Arrowhead/Crestline area socked in with clouds and very damp fog. This is making the fires very manageable. Now they are saying that there are fingers heading out from north shore Arrowhead to Apple Valley/Hesperia but not as bad as yesterday. Same as before for a finger still heading to the Big Bear area but there were no reports of how bad this hot spot is doing. Will be back later on or as conditions warrant. Update from many TV stations- very windy, cold, drizzling rain on the Rim. Wind appears to be forcing the fire towards the Hi Desert and away from Blue Jay and Arrowhead Village. Still much fuel left in them thar hills. Running Springs has dodged a bullet so far- last night it looked like the town was toast. Miraculously the fire diverted around it, I had heard of a few homes lost there, but none confirmed as of now. Foggy and temp at old Lloyds restaurant is 40 degrees. I live near Cypress CA and it is presently raining now- albeit not much- I hope this is a good sign. It may not be the beginning of the end, but it surly is the end of the beginning. Problems have developed because of winds coming up. Crews are being withdrawn from north of the hospital near Papoose Lake at the dam in Arrowhead. Hot spots are taking control and many houses are in jeopardy there. Earlier today they said the north shore campground area burned- can¹t confirm that but as I watched that segment it sure looked like it was going up. No mention of Blue Jay except that it is still there as far as I know. Running Springs is still fluid with many spot fires surrounding the town- don¹t know if any homes lost- no reports of any so far. Weather changing rapidly it is windy on the hill top now and that ain¹t good! - temps however to get down in Running Springs to 32 degrees and rain is predicted maybe on Friday night with snow level to 5000 feet. If this happens, and this is iffy now, it may help put these damned fires out. Keep your fingers crossed. One last report from Crestline area- many homes lost in Cedar Pines park no mention of how many- fires still blaze there as TV is showing-more accurate counts tomorrow hopefully. Views from Cedar Glen in Lake Arrowhead are absolutely astounding. Hookcreek road and Pineridge were the only street names visible. It looks like a world war 2 movie in Europe! There are no houses standing anywhere, block after block after block of demolished homes. The estimate is now 250-350 homes in the southern section of Cedar Glen alone destroyed by the fire, but I can¹t confirm this. No word on Arrowhead Village, but I heard about an hour ago that Blue Jay is still standing and not threatened, at least this was an hour ago. Running Springs is now threatened east of Hwy 330. There are many strike teams up there including engine companies from everywhere. Keep your fingers crossed on this one. I was watching events about an hour ago in Cedar Pines park and Valley of Enchantment in Crestline as it was getting dark. Sorry to report but many structures were on fire, I could not tell where it was because it was getting dark but they were blazing very fiercely. There were teams around the fires but there was simply not enough water to put any of these out. The houses created so much heat, the trees surrounding them go up and this just adds to the problem of extinguishing them. The TV cameras home in very close and it looks very hot! I am turning the TV off for a while- my emotions are on overload. Watching three channels at a time actually switching back and forth and my remote fingers are getting sprained. Anyway the broadcast from KNBC Channel 4 is a mile or two west of the Hwy 30 cutoff in Running Springs. They have flames on three sides of the town (not surrounded so far). Nothing lost yet. They are spraying a gel like material on the trees on the other side of Hwy 18 to try to prevent it going into houses on the other side, hope it works. TV air picture shows Cedar Glen area of Lake Arrowhead- the reporter says it looks like most of it is covered in smokey haze I can see a lot of flame and smoke. He says he has been watching it for an hour and the whole area is seems to be going up. From my vantage point it looks as if he is right. A solid line of black and gray smoke along the entire ridge line from Hwy 18 over to the Arrowhead Dam area and over behind the hospital and east of Papoose lake below the dam. It looks like a caldera in a volcano. It is now along Hwy 173. Unconfirmed reports at 8 to 10 homes burned but I know it will be much more than that. You can see black smoke interspersed with the gray which means houses going up. Picture now shows one house east of Papoose lake and it is burning very quickly. Spot fires to the north and east of Cedar Glen now reported. Watching one more house starting to catch in the area- getting too painful to watch. Dead trees every where you look-all are match sticks. The chopper views on another station is now over Crestline area and the view towards Arrowhead and Running Springs is unreal. The columns of smoke are high, huge, vast and cover many miles. The smoke is now stretching towards Las Vegas. The chopper pilot above Crestline is now showing the Julian Fire Smoke many miles away and it looks ugly and stretches very high in the air. Hollywood could not write a movie script like this one- nobody would believe it. Direct pictures from Arrowhead Hospital chopper pad near the dam- the pictures show many homes burning on Hook Creek Road in Cedar Glenn- at least ten I could count. The TV crew almost didn¹t get out because of downed trees and power poles. I timed one house and it burned entirely in two minutes! Cedar Glenn doesn¹t look like it will survive or at least look like it used to as we remember it. Chopper TV shots above Lake Arrowhead right now. The TV camera looks like it is centered just above Blue Jay and fairly high up. I can see the entire lake and especially the dam area. There is noticeable fire and smoke on the other side of the dam and in the north shore but not down to the lake edge it is back up above the lake maybe a mile or two. They say that it is headed towards the Fawnskin area on that side of the ridgelines and Big Bear Lake. Report from Green Valley Lake and looking over to Running Springs looks the fire is still active over the rim there too. Sorry but it is now confirmed and I have watched a number of homes in Cedar Pines Park go up with astounding speed, Very close in shots too-and they didn¹t appear to be small summer cabins either. 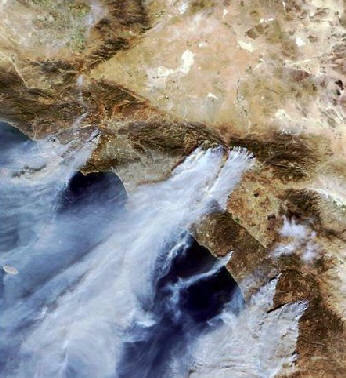 On October 27, 2003, President Bush declared a major disaster for the State of California, triggering the release of federal funds to help people and communities recover from the Wildfires that occurred October 21, 2003, and continuing. Toll-free Teleregistration number for disaster victims: 1-800-621-FEMA, TTD 1-800-462-7585. FIREupdate map of the Old Fire Area destruction. FIREupdate map of the Running Springs Area destruction. FIREupdate map of the Crestline Area destruction. 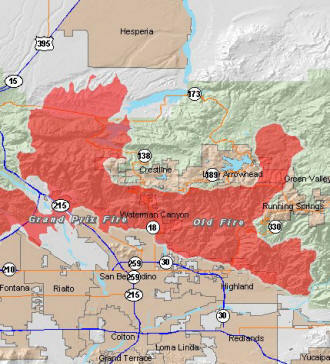 FIREupdate map of the Lake Arrowhead Area destruction. FIREupdate map of the Del Rosa Area destruction. FIREupdate map of the CSUSB Area destruction. Over 90,000 people have been evacuated! All residents should be off the mountain! Chad Williams, 70, of Crestline was dashing from his house to his car with his wife on Saturday when he suffered a heart attack. Gene Knowles, 75, of Big Bear died on Sunday while he was evacuating. James W. McDermith, 70, collapsed Saturday as he was evacuating his home. Charles Cunningham, 93, collapsed as he stood in the street watching his house burn Saturday.